For your reference I have the Coast Classic series Zenith running in my store, with another manufacturers spa. All spas are tested daily (Following BISHTA guidelines), for which I keep a record. What’s become apparent is how clear and polished the water is keeping within the Zenith compared to the American model. Also the Coast is using around half the amount of stabilized chlorine compared to the other spa. The Spas are similar in external size (actually more water volume in the coast due to height) same temperatures at 36 degrees, no bather load and I have disconnected ozone on all running tubs on show. I put my findings down to the Coast Cyclonic pressurised filtration doing its job! I have to use Spa Sparkle liquid in the non-Coast Spa to remove regular cloudy / hazy water, never used this product in my Coast spa. Its obvious that the water clarification is being taken care of by Coast Spas commercial grade cyclonic filtration system. What a selling point! Must be at the top of the list against the rest of competition, as most of the worlds manufactures use exposed filtration. 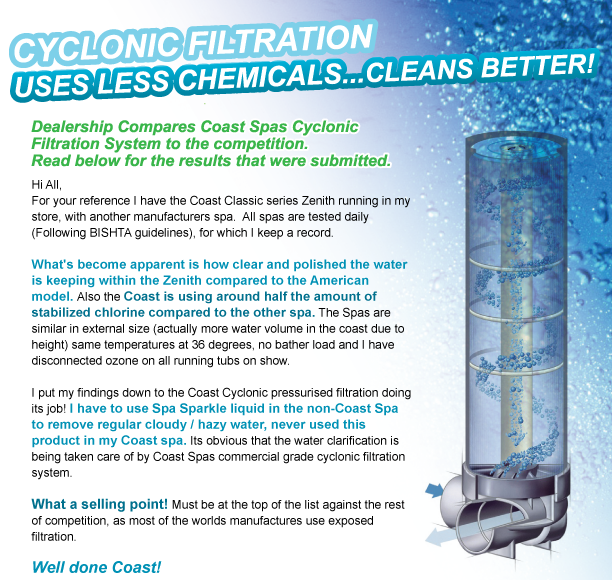 « Coast Spas Cyclonic Filtration – Prevails Under Even the Worst Conditions. THE WINNING EDGE® - TRADEMARKED!